Hello Beauties! 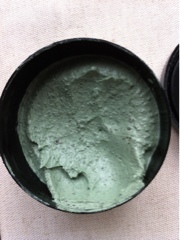 Heres a review of a Lush mask I recieved from Aqeela in a beauty box. I have always loved Lush and used to purchase a lot! 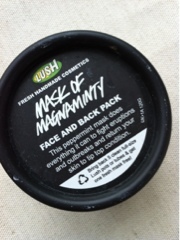 I was so pleased too see this as never tried this before and I particularly love the masks Lush do! Mask of Magnaminty is a face and back mask it states its the "peppermint mask that does everything it can to fight eruptions and outbreaks and return your skin to tip top condition". This mask has a grainy consistency, with a minty scent that you apply and leave on for 10 minutes. It instantly cools my skin, calming and soothing my current blemishes. It brightened my skin , cooling it instantly and making me feel uber refreshed. I absolutely love this and would repurchase in a flash! Have you used this? Or recommend another? Great review, I will have to try it! Sounds like a gorgeous mask! I bet the mint scent is really refreshing in the morning! I've just started using Angels On Bare Skin from Lush, i love it so far!! I definately wanna try it! This is one of my favourite face masks! I might just have to purchase this! Been really down about my skin recently and anything which might help clear it up is definitely worth a shot! I have never even tried a Lush product...bizarre! I'm currently using cupcake but I really like the sound of this being minty. I bet its all tingly and really refreshing, may have to pick one up next time I wander past!